Aren’t chocolate chip cookies the most basic of all cookies? I feel like almost everyone starts off their baking journey with chocolate chip cookies. But as with most things that are simple, mastering the perfect cookie is more difficult than you think. Everyone has their preference to a perfect chocolate chip cookie. 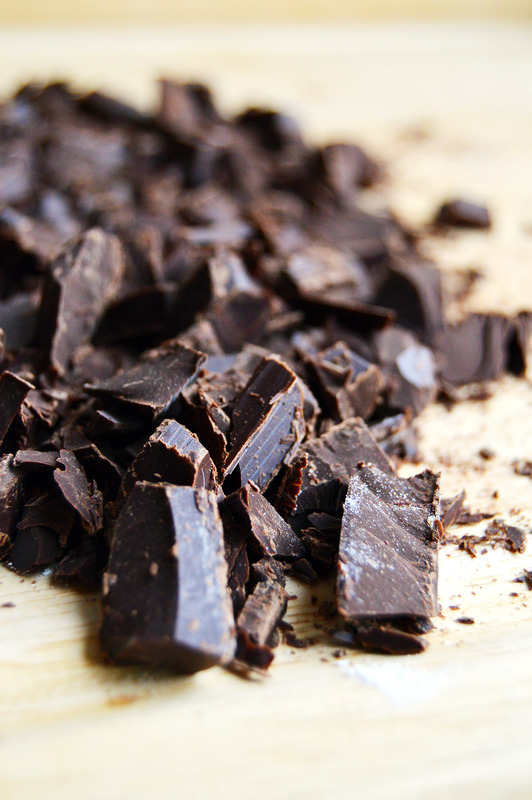 If I had to describe mine, it would be crisp on the edges yet chewy in the middle with puddles of just melted chocolate and a healthy dose of salt to balance it out. For as long as I’ve been baking, I’ve tried endless recipes of chocolate chip cookies. Starting from the cornerstone of all chocolate chip cookies, the original Nestle Toll House cookie (which always makes me think of that episode in Friends where Monica tries to figure out Phoebe’s grandmother’s cookie recipe) to the complicated Jacque Torres’s secret recipe (also known as the New York Times’ chocolate chip cookie) that uses two kinds of flour, two kinds of sugar and has a resting time of 24 hours. They were all good (because let’s face it, how can you go wrong with sugar, flour, butter and chocolate? ), but not what I was looking for. They were too puffy, too chewy, too sweet, too flat, too crispy or too time consuming. I felt a lot like Goldilocks. So I did what any picky person would do and came up with my own browned butter chocolate chip cookie recipe, which is the base of my chocolate chip marshmallow cookie cake and it has been my staple for a solid 5 years. It was complex, chewy, quick and delicious. But when I saw Deb of Smitten Kitchen’s post for chocolate chunk cookies, I broke down and had to try it. There was nothing that was stopping me from making those cookies. I didn’t care that it used THREE kinds of sugar, and that I had to chop up a huge bar of chocolate (which btw, is one of the things I hate doing and yes, you have to chop it up, chocolate chips are not the same thing). I just knew I had to make it. Well, I found it. The MOST PERFECT chocolate chip cookie EVER. I’m done. I’ve reached cookie Nirvana. Crisp on the outside? Check. Chewy in the middle? Check. Puddles of chocolate? Check. One bowl? Check. Not too sweet? Check. Salted? Check. 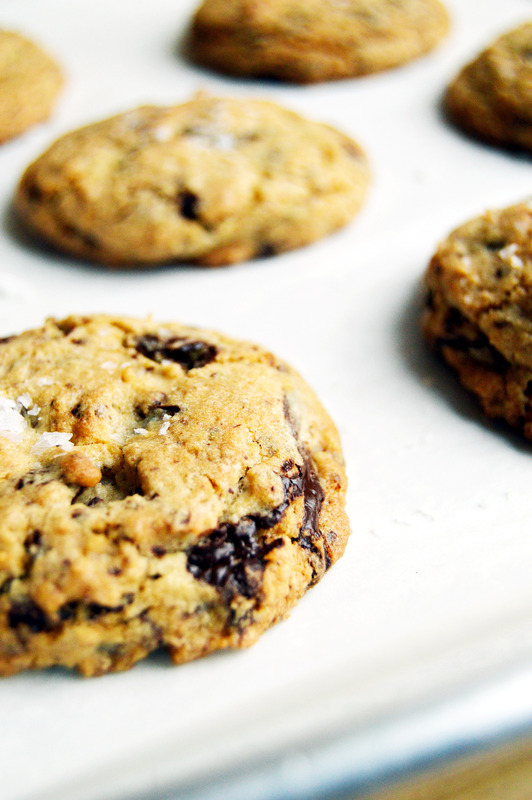 Your search for the perfect chocolate chunk cookie is over. You’re welcome. Preheat oven to 360˚F, and line two baking sheets with parchment paper. In a bowl of a standing mixer fitted with the paddle attachment, cream butter, granulated, turbinado and light brown sugar until light and fluffy. Add egg and vanilla extract until thoroughly mixed. 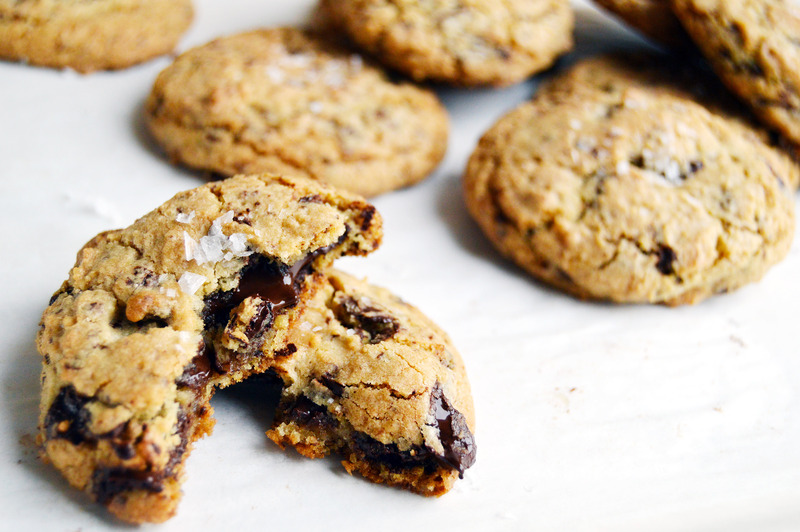 Fold in baking soda, sea salt, flour, and chocolate chunks. Using either a cookie scoop or spoons, dollop 1 ½ tbsp. 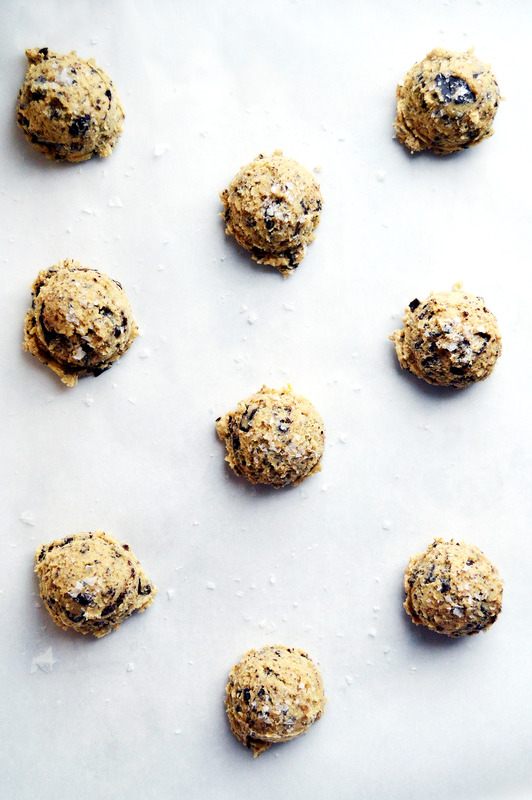 of cookie dough onto prepared baking sheets. 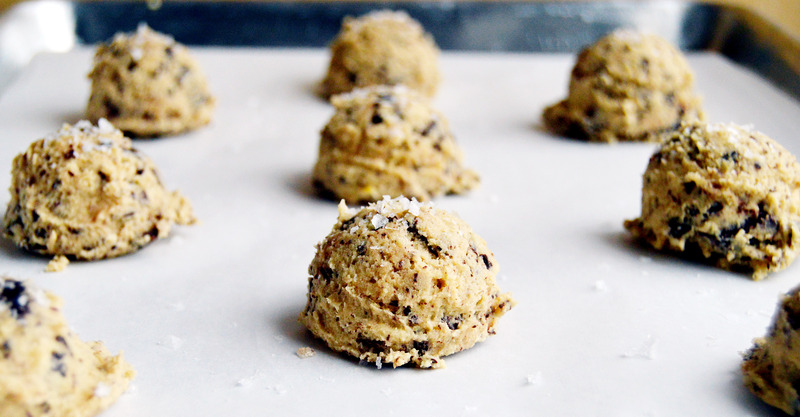 Sprinkle maldon salt over the mounds of cookie dough. Bake 9-11 minutes, until edges are golden brown. Cool 10 minutes before eating. This entry was posted in Chocolate, Cookies, Desserts and tagged choclate, chocolate chip, Cookies, dessert, salty sweet, sea salt. Bookmark the permalink. wow. i don’t usually click on cookies or anything sweet, but these just looked so good. i think i’ll save the recipe for the holidays! Thank you, Mimi ❤ I hope you give them a try! They're totally worth it.